Thus, the Mueller investigation found no “conspiracy,” no “coordination,”—i.e., no “collusion”—“tacit or express” between the Trump campaign or any U.S. person and the Russian government. The Mueller investigation did not make, seal, or recommend any indictment for any U.S. person for any such crime. This is as clear and forceful a repudiation as one can get of the “collusion” narrative that has been insistently shoved down our throats by the Democratic Party, its McResistance, its allied media, and its allied intelligence and national security agencies and officials. Whatever one wants to say about any other aspect of this investigation—campaign finance violations, obstruction of justice, etc.—they were not the main saga for the past two+ years as spun by the Russiagaters. The core narrative was that Donald Trump was some kind of Russian agent or asset, arguably guilty of treason and taking orders from his handler/blackmailer Vladimir Putin, who conspired with him to steal the 2016 election, and, furthermore, that Saint Mueller and his investigation team of patriotic FBI/CIA agents were going to find the goods that would have the Donald taken out of the White House in handcuffs for that. Keith Olbermann’s spectacular rant in January 2017 defined the core narrative and exemplified the Trump Derangement Syndrome that powered it: an emotional, visceral hatred of Donald Trump wrapped in the fantasy—insisted upon as “elemental, existential fact”—that he was “put in power by Vladimir Putin.” A projection and deflection, I would say, of liberals’ self-hatred for creating the conditions—eight years of war and wealth transfer capped off by a despised and entitled candidate—that allowed a vapid clown like Trump to be elected. It couldn’t be our fault! It must have been Putin who arranged it! This—Trump’s secret, treasonous collusion with Putin, and not hush money or campaign finance violations or “obstruction of justice” or his obvious overall sleaziness—was Russiagate. Here are the three lines of excuse and denial currently being fired off by diehard Russiagaters in their fighting retreat, and my responses to them. 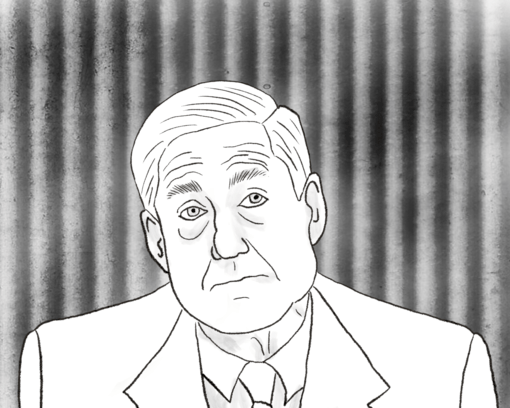 Mueller’s report will almost certainly disappoint you, and it’s not his fault. It’s your fault for buying into Trump’s false narrative that it is Mueller’s’ job to prove “collusion,” a nearly impossible bar for any prosecutor to clear. Mueller's report will almost certainly disappoint you, and it's not his fault. It's your fault for buying into Trump's false narrative that it is Mueller's' job to prove "collusion," a nearly impossible bar for any prosecutor to clear. This is, of course, the weakest volley. It’s absurd, patent bad faith, for Russiagaters to pretend that they knew, thought, or suggested the Mueller investigation was irrelevant. It is they who have been insisting that the integrity and super-sleuthiness of the “revered” Robert Mueller himself was the thing that would nail Donald Trump for Russian collusion. To now deny that any of that was important only acknowledges how thoroughly they have been fooling the American people and/or themselves for two years. Either Adam Schiff had the goods on Trump’s traitorous Russian collusion two years ago, in which case he’s got a lot of explaining to do about why he’s been stringing us along with Mueller, or Schiff is just bluffing. Place your bets. Russiagaters in 2019: Shut up Mueller, what would you know. 2. The Mueller Report didn’t exonerate Trump entirely. It was agnostic about whether Trump was guilty of “obstruction of justice,” and there are probably many nasty things in the report that may not be provably criminal, but nonetheless demonstrate what a slimeball Trump is. They will not get away with trying to appropriate, as if it were their point all along, what the left critics of Russiagate have been saying for two+ years—that Donald Trump is a slimeball grifter whose culpability for politically substantive and probably legally actionable crimes and misdemeanors should not be hard to establish, without reverting to the absurd accusation that he’s a Russian agent. So, it’s a particularly slimy for Russiagaters to slip into the position that we Russiagate skeptics have been enunciating, and they have been excluding, for two years, without acknowledging that we were right and they were wrong and accounting for their effort to edit us out. 3. But we haven’t seen the whole Mueller Report! Barr may be fooling us! Mueller’s own team says so! You are now doing what you accused us of doing for two years—abandoning proper skepticism about Republicans like Barr and even Mueller (Yup. He’s a suspicious Republican now! ), and assuming a final result we have not yet seen. This is the one the Russiagaters like the most. Gotcha with your own logic! Well, let’s first of all thank those who are saying this for, again, recognizing that we Russiagate critics had the right attitude toward such an investigation: cautious skepticism as opposed to false certainty. And let’s linger for a moment or more on how belated that recognition is and what its delay cost. But let’s also recognize that what’s being expressed here is the last-minute hope on the part of the Russiagaters that the Mueller report actually does contain dispositive evidence of Trump’s treasonous Russian collusion. Because, again, that is the core accusation that hopeful Russiagaters are still singing about, and nobody ever argued that evidence of other hijinks was unlikely. Well, that hope can only be realized if one or both of the following are true: 1) Barr’s quotes from the report exonerating Trump of collusion are complete fabrications, or 2) Mueller both wrote those words even though they contradict the substance of his own report and declined to indict a single U.S. person for such “collusion” even though he could have. Sure, in the abstract, one or both of those conditions could be true. But there is no evidence, none, that either is. The New York Times (NYT) report that set everyone aflutter about the “concern” from “some members of Mr. Mueller’s team” is anonymous, unspecified, and second-hand. Read it carefully: The NYT did not report what any member of Mueller’s team said, but what “government officials and others familiar with their simmering frustrations” said. Those “officials and others interviewed [not members of the Mueller team itself] declined to flesh out” to the NYT what “some of the special counsel’s investigators” were unhappy about. To that empty hearsay, the NYT appends the phrase “although the report is believed to examine Mr. Trump’s efforts to thwart the investigation”—suggesting, but not stating, that obstruction of justice issues are the reasons for the investigators’ “vexation.” The NYT cannot state, because it does not know, anything. It is reporting empty hearsay that is evidence of nothing, but is meant to keep hope alive. “[T]he report is believed to examine” is a particularly strange locution. Is the NYT suggesting that the Mueller report might not have examined obstruction of justice possibilities? Or is it just getting tangled up in its attempt to suggest this or that? Hey, it could just as well be true that Barr’s characterization of what the Mueller Report says about “obstruction of justice” is a misleading fabrication. Maybe Mueller actually exonerated Trump of that. If you mistrust Barr’s version of what the Mueller Report says about collusion, why not equally mistrust what it says about obstruction of justice? There is no evidence that Barr’s summary is radically misleading about the core collusion conclusion of the Mueller Report. The walls are closing in, alright, on that story. The I’m just being as cautious now as you were before! line is the opposite of the reasonable skepticism is claims to be; it’s Russiagaters clinging to a wish and a belief that something they want to be true is, despite the determinate lack of any evidence. It’s not just the words; it’s the melody, and the desperation in the voices. The core Trump-blowing-Vladimir collusion song that #Resisters are still singing is a fantastical fiction and the people still singing it are the pathetic choir on the Russiagate Titanic. And while they’re singing as they sink, Trump is escaping in the lifeboat they have provided him. The single most definite and undeniable effect of the Mueller investigation on American politics has been to hand Donald Trump a potent political weapon for his 2020 re-election campaign. A real bombshell. But it’s worse than that. The falsity of the Trump-as-a-Russian-agent narrative does not depend on any confidence in Mueller and his report or Barr and his summary. The truth is there was no Russiagate investigation, in the sense of a serious attempt to find out whether Donald Trump was taking orders from, or “coordinating” with, Vladimir Putin and the Kremlin. No person in their right mind could believe that. Robert Mueller doesn’t believe it. Nancy Pelosi doesn’t believe it. Adam Schiff doesn’t believe it. John Brennan, James Clapper, and the heads of intelligence agencies do not believe it. Not for a second. No knowledgeable international affairs journalist or academic who thinks about it for two minutes believes it. Sure, some politicians and media pundits did work themselves up into a state where they internalized and projected a belief in the narrative, but few of them really believed it. They were serving the Kool-Aid. Only the most gullible sectors of their target audience drank it. The obvious, which many people in the independent media and none in the mainstream media (because it is so obvious, and would have blown their game) have pointed out, is that any real investigation of Russiagate would have sought to talk with the principals who had direct knowledge of who is responsible for leaking the infamous DNC documents: Julian Assange and former British ambassador Craig Murray (“I know who leaked them. I’ve met the person who leaked them.”). They were essentially two undisputed eyewitnesses to the crime Mueller was supposed to be investigating, and he made no effort to talk to either of them. Ipso facto, it was not really an investigation, not a project whole purpose was to find the truth about whatever the thing called “Russiagate” is supposed to be. It was a theater of discipline. Its purpose, which it achieved, was to discipline Trump, the Democratic electorate, and the media. Its method was fishing around in the muck of Washington consultants, lobbyists, and influence peddlers to generate indictments and plea bargains for crimes irrelevant to the core mandate. Not hard, in a carceral state where prosecutors can pin three felonies a day on anyone. The US establishment, especially its national security arm, was genuinely shocked that their anointed candidate, Hillary, who was, as Glen Ford puts it “’all in’ with the global military offensive” that Obama had run through Libya, Syria, and the coup in Ukraine, was defeated by a nitwit candidate who was making impermissibly non-aggressive noises about things like Russia and NATO, and who actually wanted to lose. For their part, the Democrats were horrified, and did not want to face the necessary reckoning about the complete failure of their candidate, and the best-of-all-possible-liberaloid-worlds strategy she personified. 1) To discipline Trump, preventing any backpedaling on NATO/imperialist war-mongering against Russia or any other target. Frankly, I think this was unnecessary. Trump never had any depth of principle in his remarks about de-escalating with Russia and Syria. He was always a staunch American exceptionalist and Zionist. Nobody has forced him (that’s a right-wing fantasy) to attack Syria, appoint John Bolton, recognize Israeli authority over Jerusalem and the Golan Heights, or threaten Iran and Venezuela. But the natsec deep state actors did (and do) not trust Trump’s impulsiveness. They probably also thought it would be useful to “send a message” to Russia, which, in their arrogance, they think they can, but they cannot, “discipline,” as I’ve discussed in a previous essay. 2) To discipline the media, making “Russian collusion,” as Off-Guardian journalist Kit Knightly says, “a concept that keeps everyone in check.” Thus, a Russophobia-related McCarthyite hysteria was engendered that defined any strong anti-interventionist or anti-establishment sentiment as Russian-sown “divisiveness” and “Putin apologetics.” This discipline was eagerly accepted by the mainstream media, which joined in the related drive to demand new forms of censorship for independent and internet media. The epitome of this is the mainstream media’s execrable, tacit and sometimes explicit acceptance of the US government’s campaign to prosecute Julian Assange. 3) To discipline and corral the Democratic constituency. Establishment Dems riled up outraged progressives with deceptive implied promises to take Trump down based on the collusion fiction, which excused Hillary and diverted their attention from the real egregious failures and crimes that led their party to political ruin, and culminated in the election of Trump in the first place. This discipline also instituted a #Resistance to Trump that involved the party doing nothing substantively progressive in policy—indeed, it allowed embracing Trump’s most egregious militarism and promoting an alliance with, a positive reverence for, the most deceptive and reactionary institutions of the state. Finally, incorporating point 2, perhaps the main point of this discipline—indeed of the whole Mueller enterprise—was to stigmatize the leftists and socialists in and around the party, who were questioning the collusion fiction and calling critical attention to the party’s failures, as crypto-fascist “Trump enablers” or “Putin’s useful idiots.” It’s all about fencing out the left and corralling the base. Note the point regarding the deceptive implications about taking down Trump. Though they gave the opposite impression to rile up their constituents, Democratic Congressional leaders, for the reasons given above and others I laid out in a previous essay, did not think for a second they were going to impeach Trump. They were never really after impeaching Trump; they were and are after stringing along their dissatisfied progressive-minded voters. They, not Trump, were and are the target of the foolery. We should recognize that Russiagate/The Mueller Investigation achieved all of these goals, and was therefore a great success. That’s the case whatever part of the Mueller Report is summarized and released, and whoever interprets it. The whole report with all of the underlying evidence cannot legally be released to the public, and the Democrats know that. So, even if the House gets it, the public will only ever see portions doled out by various interested parties. Thus, it will continue to be a great success. There will be endless leaks, and interpretations of leaks, and arguments about the interpretations of leaks based on speculation about what’s still hidden. The Mueller Investigation has morphed into the Mueller Report, a hermeneutical exercise that will go on forever. The Mueller Investigation never happened and will never end. It wasn’t an investigation. It was/is an act of political theater, staged in an ongoing dramatic festival where, increasingly, litigation substitutes for politics. Neither party has anything of real, lasting, positive political substance to offer, and each finds itself in power only because it conned the electorate into thinking it offered something new. That results in every politician being vulnerable, but to a politically vacuous opposition that can only mount its attacks on largely politically irrelevant, often impossible to adjudicate, legalistic or moralistic grounds. Prosecutorial inquiry becomes a substitute for substantive political challenge. It’s the template that was established by the Republicans against Bill Clinton, has been adapted by the Democrats for Trump and Russiagate, and will be ceaselessly repeated. What’s coming next, already hinted at in William Barr’s congressional testimony, will be an investigation of FISAGate—an inquiry into whether the FISA warrants for spying on the Trump campaign and administration were obtained legally (“adequately predicated”). And/or UkraineGate, about the evidence “Ukrainian law enforcement officials believe they have…of wrongdoing by American Democrats and their allies in Kiev, ranging from 2016 election interference to obstructing criminal probes,” involving Tony Podesta (who worked right alongside Paul Manafort in Ukraine), Hillary Clinton’s campaign, Joe Biden and his son, et. al. And/or CampaignGate, the lawsuit claiming that Hillary’s national campaign illegally took $84 million of “straw man” contributions made to state Democratic campaigns. And/or CraigGate, involving powerful Democratic fixer and Obama White House Counsel, Gregory Craig, who has already been referred to federal prosecutors by Mueller, and whose law firm has already paid a $4.6 million-dollar fine for making false statement and failing to register under the Foreign Agents Registration Act—for work he did in Ukraine with—who else?—Paul Manafort. There are Gates galore. If you haven’t heard about any of these simmering scandals in the way you’ve heard incessantly about, you know, Paul Manafort, perhaps that’s because they didn’t fit into the “get Trump” theme of the Mueller Investigation/Russiagate political theater. Rest assured the Republicans have, and will likely make sure that you do. If you think the Republicans do not have at least as much of a chance to make a serious case with some of these as Mueller did with Trump, you are wrong. If you think the Republicans will pursue any of these investigations because they have the same principled concern as the Democrats about foreign collusion in US elections, or the legality of campaign contributions or surveillance warrants, you are right. They have none. Like the Democrats, they have zero concern for the ostensible issues of principle, and infinite enthusiasm for mounting “gotcha” political theater. Neither party really wants, or knows how, to engage in a sustained, principled debate on substantive political issues—things like universal-coverage, single-payer health insurance, a job guarantee, a radical reduction of the military budget, an end to imperialist intervention, increasing taxes on the wealthy and lowering them for working people, a break from the “overwhelming” and destructive influence of Zionism, to name a few of the policies the Democratic congressional leadership could have insisted on “investigating” over the last two years.. Instead, both parties’ political campaigns rely on otherizing appeals based on superficial identity politics (white-affirmative on the one hand, POC-affirmative on the other) and, mainly, on bashing the other party for all the problems it ignored or exacerbated, and all the terrible policies it enacted, when it was in power—and for the version of superficial, otherizing identity politics it supposedly based those policies on (the real determinants of class power remaining invisible). What both parties know how and will continue to do is mount hypocritical legalistic and moralistic “investigations” of illegal campaign contributions, support from foreign governments, teenage make-out sessions, personal-space violations, et. al., that they are just “shocked, shocked” about. It’s Investigation Nation. Fake politics in the simulacrum of a democratic polity. Indeed, someone, of some political perspicuity, might just notice, if only for a flash, that the people who do pretty well politically are often the ones who frankly don’t give a crap about all that. Maybe because they’re talking to people who don’t give a crap about all that. But we wouldn’t want to confuse ourselves thinking on that for too long. Which brings us to the last point about Russiagate/The Mueller Investigation mentioned above. It may not (or may!) have been an intended goal, but it has been its most definite political effect: The Mueller Investigation has been a great political gift to Donald Trump. #Resisters and Russiagaters can wriggle around that all they want. They can insist that, once we get the whole Report, we’ll turn the corner, the bombshell will explode, the walls will close in—for real, this time. Sure. But even they can’t deny that’s the case right now. Trump is saying the Mueller investigation was a political counterattack against the result of the election, masquerading as a disinterested judicial investigation; that it was based on a flimsy fiction and designed to dig around in every corner of his closets to find nasty and incriminating things that were entirely irrelevant to the ostensible mandate of the investigation and to any substantive, upfront political critique—a “witchhunt,” a “fishing expedition.” And he is right. And too many people in the country know he’s right. At this point, even most Russiagaters themselves know it—though they don’t care, and will never admit it. You might think the Democratic Party would be horrified at this result, which one conservative analyst calls: “one of the greatest self-defeating acts in history.” You might think Democrats would now move quickly and decisively toward a strategy of offering a substantive political alternative, and abandon this awful own-goal Mueller/Russiagate tack that has already helped Trump immensely (and which they are not going to turn their way). That is obviously what would happen if the Democrats’ main goal was to defeat Trump. But it isn’t. As discussed above, the Democratic establishment’s’ main goal throughout this was not to “get” Trump, but to channel its own voters’ disgust with him into support for some halcyon, liberal, status quo ante-Trump, and away from left demands for a radical change to the social, economic, and political conditions that produced him and his clueless establishment opponent in 2016. The Democrats’ goal was, and is, not to defeat Trump, but to stave off the left. The Democrats’ main goal in all this is not to impeach, or stop the re-election of, Donald Trump; it’s to prevent the nomination and election of Bernie Sanders, or anyone like him. Yup, it’s those Russians, you see, sowing division through certain “politicians and leaders,” who are preventing us from fixing our healthcare, education, economic and government systems. This—doubling down on Russiagate—is the centrist Democrats’ idea of a winning political appeal. I consider it utterly delusional. You mean the five million people who voted for Obama in 2012, in the 90% of counties that voted for Obama either in 2008 or 2012, but would not vote for Hillary in 2019, aren’t streaming back into – are indeed still streaming out of – the Democratic Party, despite all the Mueller investigation has done for them? Imagine that. What has Russiagate/The Mueller Investigation wrought? It’s either a shrewd political gambit sure to take down Trump, or it’s ridiculous political theater leading Democrats, and the country, over another cliff. Double-down or leave that table?